Do you want to take your kitchen? Then you should leave the disassembly and re-assembly as well as the handling of electrical equipment and electrical connections to the pros. 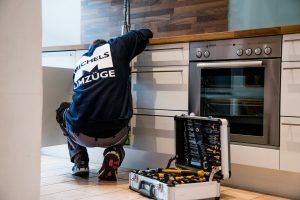 Michels International has its own kitchen fitters, who attend exclusively to the installation of new and used fitted kitchens and are familiar with any and all common kitchen systems. We disassemble your kitchen professionally and completely reinstall it in your new home. The improvisational skills of our carpenters are in great demand here because changes are virtually inevitable: Water and electricity connections are almost always in different places than they were before. The refrigerator no longer fits where it previously stood; the countertop is too short or too long, and the floor units must be fitted at an angle in the new place. You will receive personal on-site advice from us for the optimal installation of your kitchen. Please don’t hesitate to contact us.